Geelong-Korea and Adelaide will chase vital Brut Australian Baseball League wins when they square off in a four-game series in Geelong from Thursday night. GK enter round four bottom of the South-West Division - seven wins back from frontrunners Melbourne and Perth - with two wins from 12 games. The Bite are four wins back from the division's top-two after splitting their four-game series against the Heat in round three. Geelong-Korea took game one of its series against Melbourne last round - a week after shocking Perth in their series-opener - but struggled as the series went on. They fell 18-12 on Saturday night and dropped to a 11-1 loss in game four, missing the chance to split the series. GK has added right-handed pitcher Ji-Woong Park to its round four roster, along with former KBO utility Jong-Hyuk Lim. Lim played 32 games for the Lotte Giants across the 2013 and 2014 seasons. Geelong-Korea will be hoping Lim provides a boost to their struggling offence. GK's 37 runs are second fewest in the ABL. Adelaide has also struggled offensively, managing 39 runs in 12 games this season. The Bite split their round three series with the Heat, blowing a shot at an important series win after taking the opening two games. Adelaide's Australian starters struggled in game three and four as Perth amassed 30 runs after scoring two in the first two games of the series. 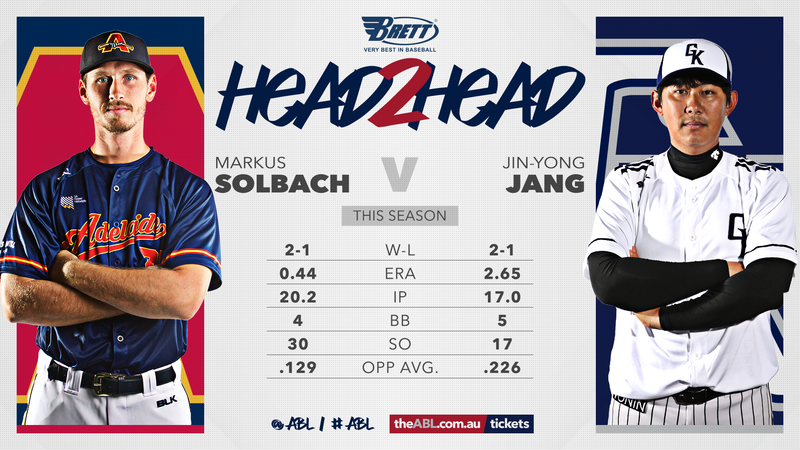 Probable game one starters Jin-Yong Jang (Geelong-Korea) and Markus Solbach (Adelaide) have started the season in impressive fashion. Jang has been a standout on Geelong-Korea's struggling pitching staff, compiling a 2-1 record and 2.65 ERA. Solbach also holds a 2-1 record. The German recorded a franchise record 14 strikeouts in the Bite's game one win over Perth last weekend and has an ERA of 0.44. Geelong-Korea and Adelaide rank last and second-to-last in the ABL for ERA. GK has allowed 8.63 runs per nine innings and the Bite 5.26. They have also given up more home runs than any other teams in the league. Geelong-Korea has surrendered 23 long balls and Adelaide 12. Check out the full round four broadcast guide here!